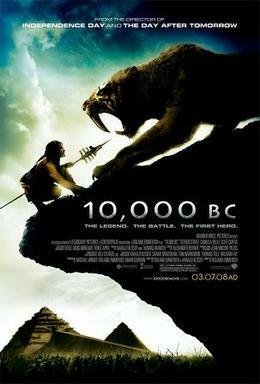 10,000 BC is a 2008 American film set in the prehistoric era directed by Roland Emmerich and starring Camilla Belle and Steven Strait. The film is slated for a March 7, 2008 release. Mammoth hunter D’Leh (Steven Strait), a member of a hunter-gatherer tribe living in 10,000 B.C., travels through unknown lands on a quest to rescue his people from extinction. Leading an army, D’Leh uncovers a lost civilization while in pursuit of a warlord who kidnapped his love, Evolet (Camilla Belle). D’Leh and his army come face-to-face with saber-toothed cats, woolly mammoths, Phorusrhacids, and ground sloths in the journey to save his people. ~ by darkdestroyer on March 2, 2008.